Experts and journalists have been commenting on Maria Zakharova’s recent appointment as head of the Russian Foreign Ministry’s Press and Information Department. Zakharova has asked journalists to view her social media posts as an expert opinion rather than as ministry statements. 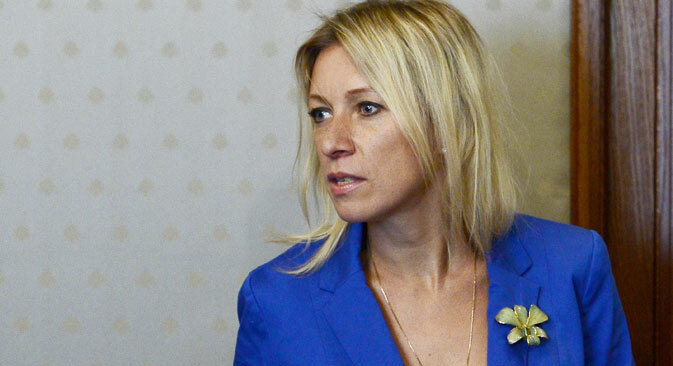 Maria Zakharova is the first woman to become the official spokesperson of the Russian Foreign Ministry. Her appointment was announced on Aug. 10. In the post, Zakharova has replaced Alexander Lukashevich, who has been appointed Russia’s permanent envoy to the OSCE. Prior to her appointment as head of the ministry’s Press and Information Department, Zakharova served as its deputy head and a personal PR manager to Foreign Minister Sergei Lavrov. She accompanied him on foreign trips and regularly posted mobile-phone pictures of the minister taken in an informal setting. As a result, one of the strictest, from the point of view of protocol, ministries has developed a human touch. However, her breakthrough achievement is considered to be the ministry’s foray into social networks in February 2013. Zakharova herself likes to recall the incident when the Russian Foreign Ministry website was down because of a hacker attack and for a while its main window to the outside world was the ministry’s Facebook account. Zakharova has promised that after her promotion, active work in social media will continue. “The language and communication style there are quite different, so addressing social network users with the Foreign Ministry’s proverbial concern and expressing emotions that diplomats express in quite restrained language … – we simply realized that the audience were expecting something different from us. I think this genre will survive too because it is in demand and it has been received very well,” Zakharova said in an interview with the TASS news agency. However, writing on her own Facebook account on Aug. 22, Zakharova asked journalists to view her personal social media posts as an expert opinion, not as official statements from the Russian Foreign Ministry. In the past 12 months, Zakharova has been a frequent guest on TV and radio. She attributes this to the Ukrainian crisis and to tensions in Russia’s relations with the West. “Because of the crisis in Ukraine, foreign policy has entered every household. That crisis has cut right through our lives. No other crisis has been so painful for our people. Russia and Ukraine are a single body. Half of my family have Ukrainian surnames and I spent my childhood listening to my grandfather singing Ukrainian songs,” she said in an interview with the Komsomolskaya Pravda newspaper. In a comment for RBTH, journalist Yury Paniyev, who heads the foreign politics desk at the Nezavisimaya Gazeta newspaper, said: “Maria is incredibly hard-working and respects journalists. I remember when she was heading the press service of the Russian mission to the UN in New York, it seemed the notion of sleep was quite alien to her. According to Babich, Russia has been “constantly under attack” for the last year or so and it is necessary to respond “robustly” to these attacks, at the same time making sure that the Russian position is made clear. “Zakharova is a symbol of a new tactic of the Russian Foreign Ministry, of its new style. In order to put the essence of Russian foreign policy across to the general public, a new, striking and exciting personality was needed,” he told RBTH. The fact that Zakharova’s appointment signifies more changes to come is obvious from the way she gave her interview to RBTH. Many Russian journalists remember too well how a mere five years ago, in order to receive an official comment from the Russian Foreign Ministry, it was necessary to file an official application and then wait, sometimes for a couple of days. These days arranging an interview is not an easy thing either, but for the sole reason that Zakharova is so busy. In the end, she gave a brief interview for RBTH via Facebook messenger. RBTH: What scares you the most in your new job? Maria Zakharova: Lack of time. RBTH: How do you feel about some media presenting you as ‘the new face’ of Russian foreign policy in addition to Sergey Viktorovich [Lavrov], a less formal but at the same time a more gutsy one? M.Z. : Coming up with pithy and striking comparisons and metaphors, especially when speaking about ‘newcomers’, is part of the media’s job description. So I am quite understanding. The main thing is not to allow metaphors to replace the essence of journalism, i.e. objectivity. RBTH: Which stereotypes about Russia do you think should be broken? M.Z. : In my view, journalists, in principle, have no right to use stereotypes. Otherwise, they are not journalists but propagandists. Will you continue going to the gym? Do you have a favorite sport? M.Z. : Yes, I will. I like roller-skating, cycling, swimming and shooting.